A previous article described Ethel Carnegie Holdsworth as Britain’s first anti-fascist. It is pleasing coincidence that the second anti-fascist in British history was also, like her, a working-class woman. Published in October 1924, presumably to accompany the second anniversary of Mussolini’s seizure of power, the first sustained piece of anti-fascist writing in Britain was published by a left-wing radical education campaign, the Plebs League. 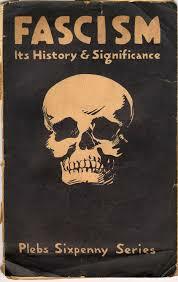 Thirty-eight pages long, and printed in a distinctive gothic front, the cover shows the image of a skull, presumably to represent the fate of the left if it did not respond adequately to the new far right. The pamphlet’s publishers, the Plebs League, were the distant ancestors of today’s trade union education movement, with a network of organisers giving classes to some 30,ooo students a year in trade unionism, psychology, economics, geography, the politics of trade unionism and of the industrial co-operatives. The author chose to remain anonymous, giving herself no more than the initials LW. The members of the Plebs League executive at this point include the historian of the feudal economy Maurice Dobb, the publishers Eden and Cedar Paul, the writer Raymond Postgate, JT Walton Newbold (who had been, briefly, one of Britain’s first Communist MPs), Ellen Wilkinson, and Winifred and Frank Horrabin. 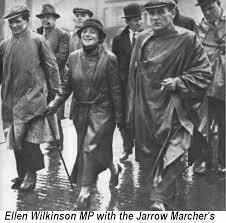 The most likely candidate is Wilkinson, who has gone down in history as the MP who led the Jarrow March, and was later the Minister of Education in Clement Attlee’s 1945 Labour government. She was in 1924 a full-time official of the precursor of today’s USDAW shopworkers’ union, the newly-elected Labour MP for Middlesbrough East and a recent ex-Communist. She was also a creative writer and her 1929 novel Clashtells a story of romantic entanglements and revolutionary politics in the Yorkshire coalfields during the 1926 General Strike. LW’s pamphlet Fascism tries to steer a narrow course between parliamentary and revolutionary socialism, which would be consistent with Wilkinson’s recent membership of the CP. Indeed Wilkinson would travel to Italy in July 1925 and meet anti-fascists there, and in 1935 she would publish a further pamphlet Why Fascism?together with Edward Conze, an anti-fascist Communist in exile from Bonn. LW begins her pamphlet with smashing of the Italian labour movement in 1919 -20, Mussolini’s beating and burning of his opponents: ‘The murderous policy of the Fascists during the period preceding their seizure of power was directed almost entirely against the workers.’ Fascism, LW acknowledged, used a language of class collaboration, and hinted at the possibility that one day workers might enjoy some say over the control of Italian industry. But this, LW insisted, was mere ‘nauseating cant’ (pg. 6). Fascism was ‘a force directed against the interests and ideals of the workers’, (pg. 7). LW referred to Clara Zetkin’s June 1923 presentation to the Executive of the Communist lnternational (republished in 2018 by Haymarket), from which LW drew the conclusion that fascism was the punishment of the propertied for the Italian left’s failure to carry through the revolution that had been possible in 1918. The author blamed the defeat of the Italian workers on the Italian Socialist Party which as late as 1920 had attempted to fudge the difference between the reformist and the revolutionary approach to seizing power (pg. 12). The pamphlet was familiar with figures such as the parliamentarians Serrati and Turati (Wilkinson had attended the April 1921 Congress of the Communist International, where the respective failings of each had been discussed). The Communists, ‘Zinoviev and his friends,’ LW writes, ‘were right’ to demand the removal of reformists from the Italian Socialist Party; ‘and Serrati’ (who had sought to hold both reformists and revolutionaries together within a single left-wing party) ‘was wrong. There is a time to hold one’s hand and a time to strike hard, and the hour for striking hard had come in Italy in the autumn of 1920’ (pg. 14). LW described the occupation of the Italian factories in 1920 as the high-point of recent struggle, showing the potential for ‘workers’ control’ (pg. 15). From their leader’s irresolution all subsequent defeats had followed. Fascism, the pamphlet argued, was a ramp of ‘industrial capitalists’ – not the landowners, not the army, not the professions – but the employers of heavy industry. If, under Mussolini, workers had joined its corporations this was only ‘out of fear’ (pg. 21). Elements of the industrial class remained aloof from fascism, it found its keenest support among employers in military production (pg. 28). The author concluded her section on Italy by envisaging the possibility of a capitalist rejection of fascism, or of both the fascists and the capitalists being overturned by the workers (pg. 30). If anything, LW appears to have underestimated the capacity of Italian capital to maintain conditions of dictatorship and one-sided class war against the workers. In common with Zetkin and other Marxist writers of this period, LW treated fascism as an international force: ‘a menace to the workers throughout the world’ (pg. 35). She acknowledged the success of Hitler and referred to his ‘temporar[y] retire[ment]’ from active political life – in October 1924, he was nearing the end of his eight-month sentence for participation in the Beer Hall putsch. She describes the success of fascist parties in Austria, Poland and Hungary. In a warning to those who attempt to describe a developing movement before it has fully formed LW wrote, overconfidently, that ‘In France, Spain … there is no real Fascist movement except in name’ (pg. 33). She was on stronger ground in describing the British Fascists as ‘an object of laughter … a glorified Boys’ Brigade’ (pg. 35). ‘Fascism,’ LW argued, ‘is a move in the class war, and its opponents can hope to succeed only if they recognise this fact and act accordingly’ (pg. 35). In terms which pre-empt the united front discussions of the 1930s, the author called for complete unity among working-class parties (i.e. Socialists and Communists) but radical distancing from the bourgeoisie. The fascists, she argued, were the direct expression of big business and the landlords, the Liberal politicians their indirect expression. Neither were the answer. ‘The courage and the political sense of the Italian workers have often been proved; if their leadership and organisation can only reach the same high standards in the coming struggle; Fascism can be crushed and a workers’ government set up in Italy’ (pg. 38). Given the range of Wilkinson’s personal experience, her time as a worker and a union organiser in a largely female industry, and her own creative writing, there are perhaps omissions. Fascism and its opponents are examined in purely economic and social categories, there is no sense of fascism’s dependence on the Church and the monarchy, still less any integration of these power realities with a sense (for example) of the gendered way in which fascism appealed to workers. That said, LW is an acute observer of fascism; her pamphlet stands on an equal footing with the most cited work of this generation – Gramsci’s writings on fascism, Zetkin’s, or the likes of Trotsky or Thalheimer.